It has now been well established that if you’re a production house lacking a good script look to your Southern counterpart who may have just what you need. The latest remake to join the list is that of Gautham Menon’s path breaking bilingual romantic drama films Vinnaithandi Varuvaaya in Tamil and Ye Maaye Chesave in Telugu. The films that originally starred Trisha Krishnan and Simbhu in Tamil and Samantha Prabhu and Naga Chaitaniya in Telugu will hit the Hindi screens early 2012 with Prateik Babbar and Amy Jackson in lead roles. Rahman takes the position of composer again and Gautham Menon has directed the film himself. While Prateik Babbar is not a new name to the fans of Hindi cinema, Amy Jackson is a new one. The British actress and model debuted in the blockbuster Tamil historical drama Madraspattinam. This will be her first outing in Hindi and it is expected that she will be dubbed by singer and dubbing artiste Chinmaye, who incidentally also dubbed for Trisha and Samantha in the earlier versions. Earlier in 2011 the audience saw the remake of another Gautham Menon film, Force, originally Kaakha Kaakha in Tamil. However, with that one Gautham had let go of the director’s baton and Nishant Kamat had taken up the job. This time around Gautham has chosen to direct the remake himself. Gautham joins the trend of South directors bringing their films themselves to the Hindi audiences rather than giving it up to a new director. A R Murgadoss (Ghajini) and Siddique (Bodyguard) both had great successes when they brought their originals to Hindi films. Ek Deewana Tha’s synopsis has been captured perfectly by the title itself and the words penned by Javed Akhtar for the opening track in the promo. “Dil hote jo mere seene mein do, doosra dil bhi tumhe deeta todne ko’ (if I could possess two hearts, I’d give you them both simply to break). The story is one of Sachin and Jesse. A couple who may be destined to be together or who could be destined to part ways. But what their destiny is hardly what makes up Ek Deewana Tha. It is about the journey to that realisation, the madness that is love and most importantly, it is about the unexplainable need to give your heart away to a person who you know may just break it. 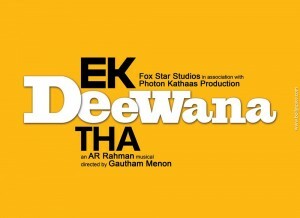 What will be interesting to see the climax of Ek Deewana Tha as the two earlier version of the film each had their own unique endings to suit the audiences of the Tamil and Telugu film industries. It is believed that Mr. Menon has gone for yet another new climax unlike any of the two seen already to suit the sensibilities of the Hindi audiences. 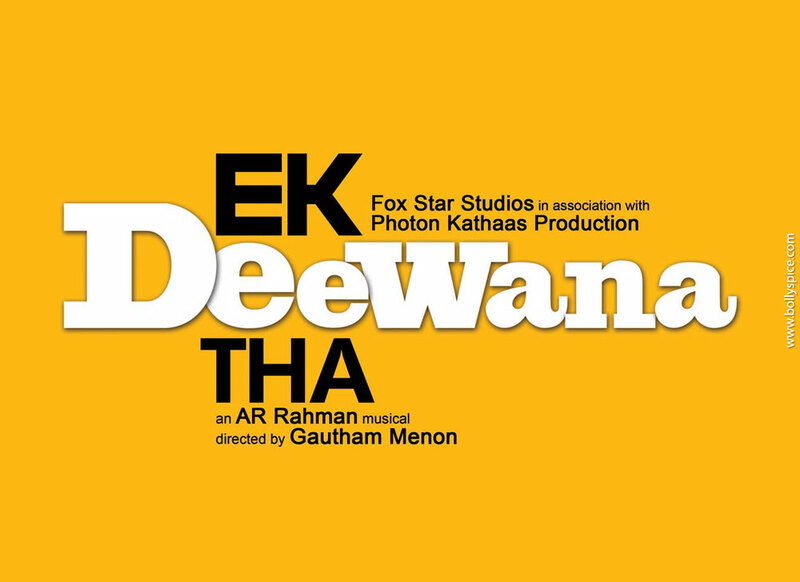 Ek Deewana Tha is expected to release on 13th of January 2012 and music will be in stores late 2011. Check out this first poster and the trailer!